The men's Tech Top Long Sleeve Half Zip is a winter sports MVP. 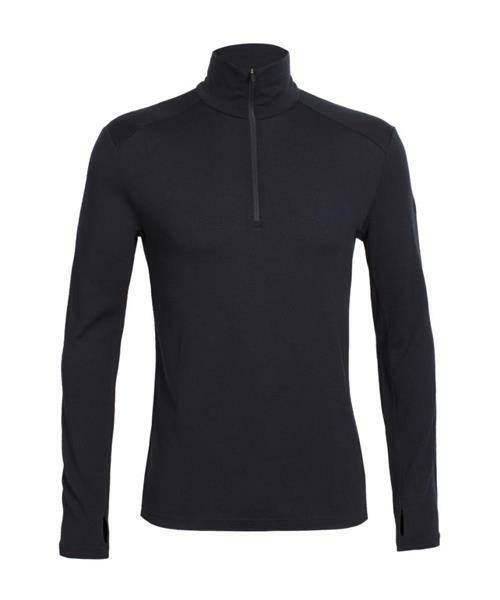 Built from Icebreaker's highly insulating 260gm merino fabric, it keeps your body warm but remains breathable and amazingly soft when worn as a baselayer, or alone on long hikes in the high mountains. With set in sleeves, forward side seams and offset shoulder seams, it won't chaffe when you work out or under a pack, and the drop tail hem provides a little extra coverage against chilly air. If you really start to heat up, the half zip provides instant cooling. And merino's natural odor resistance makes it the perfect jersey for multi day adventures. * Care: Machine wash. Dries fast in the shade, but do not tumble dry. Exact instructions on the care label. Tech Top LS Half Zip - Mens is rated 4.6 out of 5 by 8. Rated 5 out of 5 by JasonR from Too Bad Winter is Over I bought this top at a local bike shop and loved it so much - and after wearing it for a week straight - I ordered another one online. I still can't believe how comfortable these tops are both in terms of feel and temperature. It keeps me warm on colder days yet doesn't overheat on warm days. Magic! It's too bad that winter is winding down in the northern hemisphere but I'm planning to wear it as long as possible this spring. Rated 5 out of 5 by JanD from Everlasting Icebreakers I have three of these sweaters, two of them are the old style model with two colour arms. I've had those two for 5 years and I use them as my base layer when I'm skiing in Quebec, they keep my torso warm in a wide range of temperatures, the thumbholes ensure no gaps between jacket and gloves. After five years they still have the shape and texture that is good enough to wear on non skiing days. They wash well and are worth every penny. Rated 4 out of 5 by Algerino from This shirt survived running @ -30oC Like the cut and the warmth of the shirt. Used it as baselayer when running outside in Temperatures up to -30oC in Ottawa. The only downside is the zipper as it does not have a protection at the top part of it. Rated 4 out of 5 by CaribouVersatility from Love this shirt I love versatility of this shirt. Wether its worn as base layer on a cold day, or the only layer under the shell on a mild day, or just around the house. It's kept my temperature regulated just right in a wide variety or climates. Rated 5 out of 5 by Fred14 from Not my first ! I already own several variations of this shirt (different weight, zip/no zip) and nothing is as comfortable as these !! Your body always seems to hover around the right temperature when you wear them, irrelevent of the activity you are performing, from easy stroll to hard cross country skiing. Rated 4 out of 5 by Vanblues from Future Reliability Great layer, and quite effective worn on its own, really at home both in the city and on the mountain. Comfy and worm, great fit, only thinking about how durable it is going to be, as I intend to wear it on a couple of hunting trips, I should follow up with an update. Rated 5 out of 5 by BrendaN from Great for golfing I bought this shirt for fall golfing. Used it today in 15 degree weather and it was fantastic. Really looking forward to using this shirt in Scotland.